Comments: John Thomas Blair was born in Richmond, VA, ca. 1835, and was the son of John Blair, a physician, and Elizabeth Blair. The Blairs came from Scotland, and the family were represented by soldiers in the Revolutionary War. By 1850, John and his mother and three siblings (Mary, Ann, and James) were living in Scottsville. As a young man, John went into the commission business and then became a merchant in Scottsville. When Virginia joined the Civil War, John and his brother, James, wasted no time in enrolling in the Confederate Army with the Scottsville Guard on 17 April 1861. 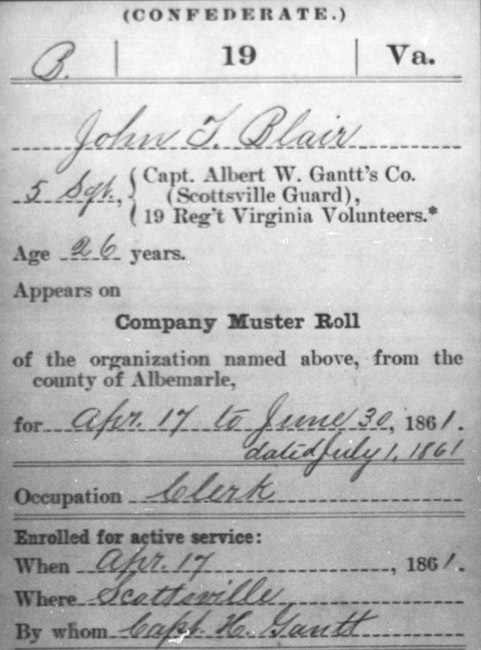 John was mustered into service in Charlottesville, Virginia, on 11 May 1861; see his company muster roll information above. John served as clerk in his company, and in November 1861, he was elected 1st Sergeant of Company C and then 1st Lieutenant in April 1862. On January 29, 1862, John was appointed Assistant Commissary for Company C, and elected Captain of Company C by November 1862. In 1863, John was captured by the Union Army and held in a Northern prison six months before being exchanged. John was dropped from the rolls of the 19th Virginia Infantry by act of Congress on 31 July 1863, and his capture may have occurred prior to that date. After his release from the Northern prison, John returned to Scottsville where he married Martha M. Wade in Albemarle County on 13 January 1864. 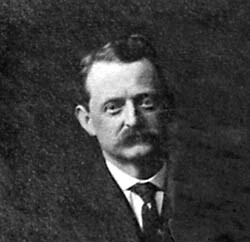 John continued his work as a Scottsville merchant as the town slowly began their recovery from the war's economic impact. John and Martha Blair became the parents of three children: Joseph Percival Blair (b. 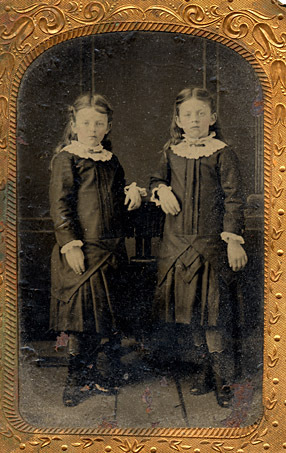 9 Oct. 1864) and twin daughters, Ameilia and Theodora (nicknamed 'Dot' and 'Dimple'; b. 1874). Joseph lived in Scottsville and became a dentist; he also served as a director of the Scottsville National Bank, clerk of the Town of Scottsville, and a member for 30 years of the Albemarle County School Board. Joseph also served as an elder in the Scottsville Presbyterian Church. His sister, Amelia eventually moved to Richmond, and Theodora married J.R. Guthrie. 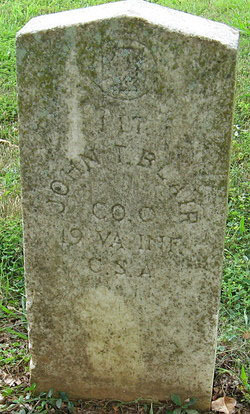 John Thomas Blair passed away in Scottsville from pneumonia on 10 March 1895 and is buried at Scottsville Cemetery. On 4 April 1905, Martha M. Blair, applied for an annual pension of $25 from the state of Virginia as the surviving widow of this Virginia Confederate soldier. 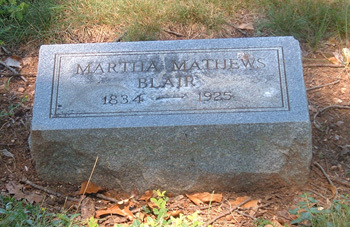 Martha passed away in Scottsville in 1925 and is buried beside her husband at Scottsville Cemetery. 1) "Compiled Service Records of Confederate Soldiers Who Served in Organizations From the State of Virginia." Publisher: Nara; Catalog ID 586957, Roll 0616; Nara M3234. 2) 1850 U.S. Census, Scottsville, Albemarle County, Virginia; Roll: M432_932, Page 299B; Image: 603. 3) 1870 U.S. Census, St. Annes Parish, Albemarle County, Virginia; Roll: M593_1631; Page 560B; Image 592. 4) 1880 U.S. Census, Scottsville, Albemarle County, Virginia; Page: 215B; Enumeration District: 009. 5) Confederate Pension Rolls, Veterans and Widows, Library of Virginia, Richmond, VA. Collection # CP-1-058, Roll description: Accomack County to Albemarle County (Surnames A-E). 6) Rebirth of the Old Dominion: Virginia Biography, Vol. IV, by Special Staff of Writers. The Lewis Publishing Company: Chicago and New York, 1929. Digitized version available at Virginia Beach Public Library (http://archive.org/stream/virginiarebirtho04bruc/virginiarebirtho04bruc_djvu.txt).